Retinitis pigmentosa is a term coined by Donders in 1855. It is not one disease, rather a group of retinal diseases with common attributes. The incident seems to be about one in every 4,000. It can be inherited by at least three different methods. Severity and speed of vision loss vary with each form of inheritance. The following are problems common to RP. Progressive loss of visual fields is a hallmark of RP. The visual field loss often begins as a donut like ring in mid-periphery. As it progresses both centrally and peripherally, the resultant tunnel vision begins to affect the patient’s activities, driving and mobility. Many patients still drive automobiles in the early stages of RP, but the risks for accidents increase as the field reduces. The functional field will be worse at night and in bad weather. Even RP patients in the early stages should not drive in these situations. As the field loss progresses, daytime driving must be curtailed. Studies suggest that on average, the visual field of the RP patient declines by 5% of the remaining field per year. Visual field loss can be aided with visual field awareness systems. These include the Gottlieb Visual Field Awareness System, press-on field awareness prisms and reverse telescopes. Prisms work by shifting in the images so that a small movement of the eyes allows the patient to pickup objects from the side. Reverse telescopes minify the image to fit inside the patient’s remaining field of vision. Reverse telescopes require adequate visual acuity. A visual acuity of 20/80 or better is recommended. 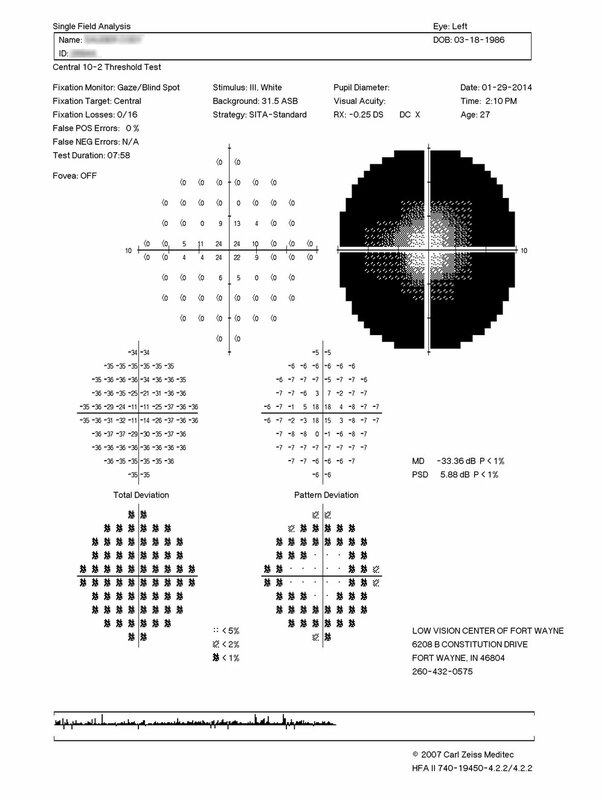 Reverse telescopes are considered when the visual field is less than 10 degrees. Mobility and orientation training must also be initiated. The other hallmark of RP is night blindness. It may be the first presenting sign. Our rod cells are sensitive to low light levels and these are the first cells to degenerate in RP patients. Thus at night, the RP patient’s functional field becomes much worse and problems in mobility increase. Adding lighting around the patient’s home, carrying a broad beam flashlight and the use of infrared night scopes have all been used to aid patients at night. Since RP patients often wear tinted lenses, it is important to have clear lenses to return to at night. While most doctors are familiar the visual field loss and night blindness of RP, they often fail to understand the severity of the light and glare problems. When RP patients go into bright sunlight, they are often overwhelmed by “white-out” debilitating glare. They are aided by the use of dark plum and amber filters used often with side shields. RP patient also frequently report glare problems inside. Many find a light amber filter in their general wear eyeglasses improves their tolerance. A variety of filters are available. The most well known are the Corning CPF lenses. RP patients frequently develop a form of cataract. It may reduce visual acuity and increase glare. Often the RP patient simply assumes it is just the RP and fails to see his or her eye doctor. Removal of the cataracts may lessen glare and improve visual acuity. Hearing impairment occurs frequently in RP patients. A unique syndrome of RP and profound congenital hearing loss is called Usher’s Syndrome. The combination of both loss of vision and hearing creates a much greater problem. Each must be dealt with early and careful educational intervention is required. Dorothy Stiefel has written a wonderful book on this called The Madness of Ushers Syndrome: Copying with Vision and Hearing Loss/Usher’s Syndrome Type II. Doctors, family and the patient must understand the emotional impact of diagnosing RP. A young individual is being told that they may eventually be profoundly impaired and perhaps totally blind. Counseling may be advised. I recommend Dorothy Stiefel’s wonderful books on living with RP, Dealing with the Threat of Loss and Stress and Well-Being. They are available in large print and cassette through Amazon.com.